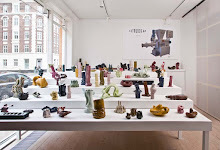 Mindful ceramic-political exhibition on post-industrial contemporary. 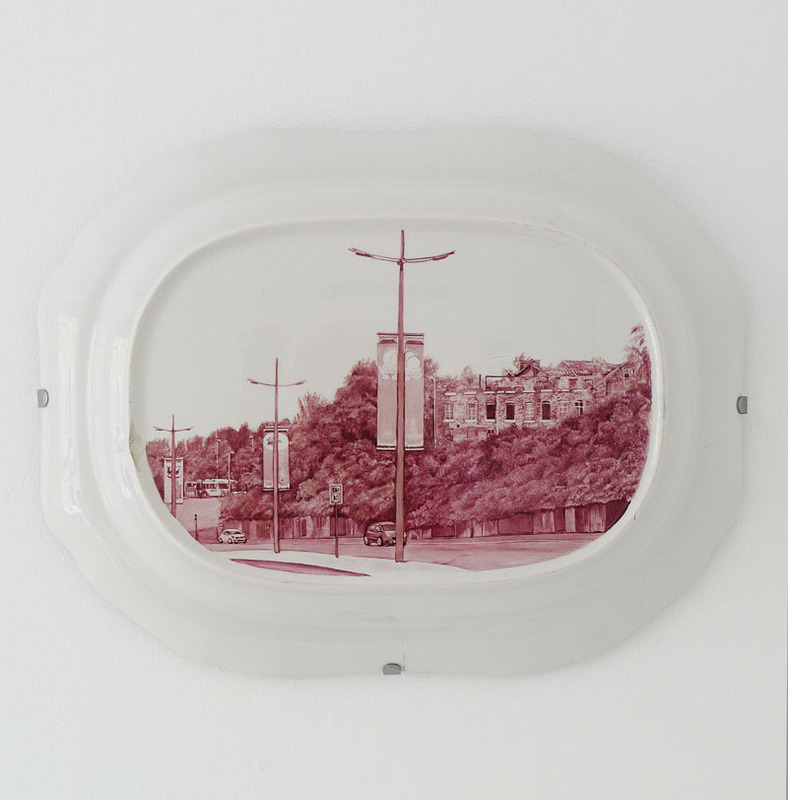 The derelict porcelain industry of the West is the focal point for the exhibition. 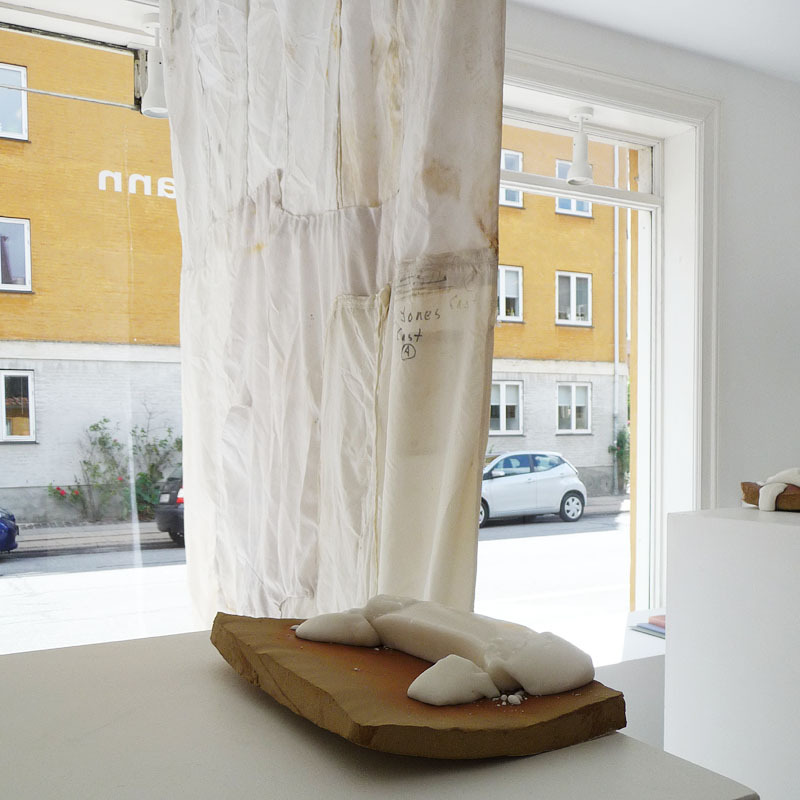 Three Norwegian-British-Danish artists visualise the relevant theme, philosophies and ideas behind an international collaboration project. 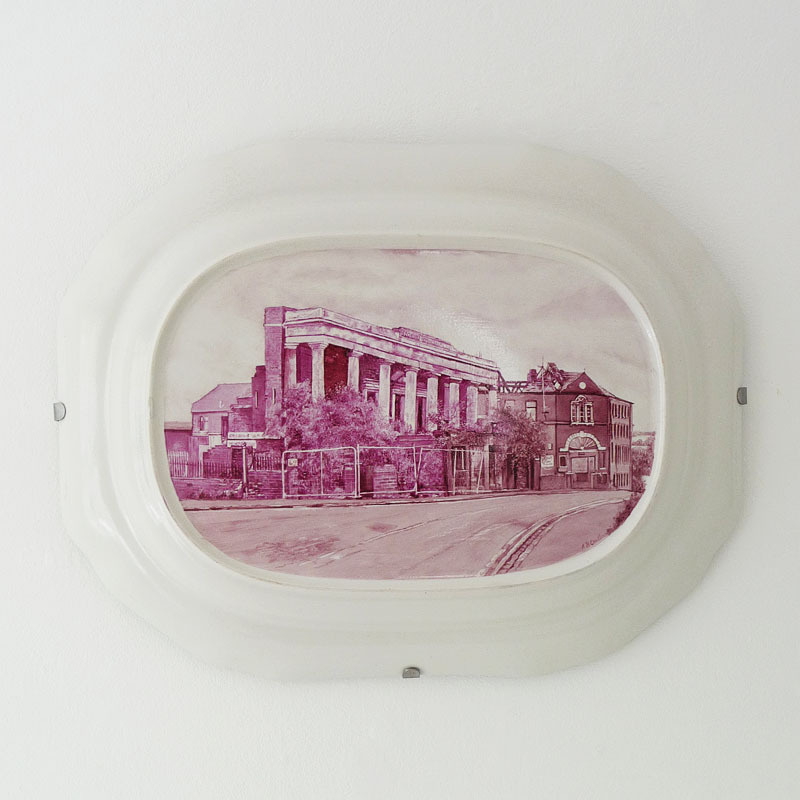 The exhibition shows thoughtful artistic visions and a special survey of the post-industrial landscape and related stories about the Western abandoned porcelain industry, based on a once-famous British ceramic capital, Stoke-on-Trent and the factory Spode, which was the key stone of the city's industrial heritage, acting at the same place for over 230 years, where abandoned buildings now bear witness of catastrophic fluctuations in global success. 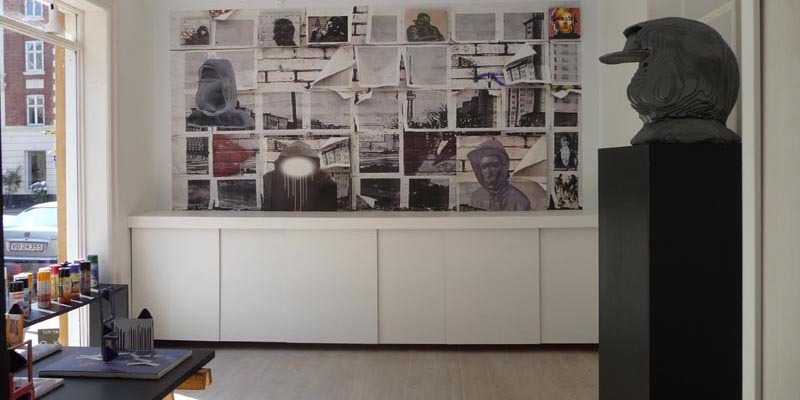 www.topographies.khib.no - artists, projects, publications, event archive. 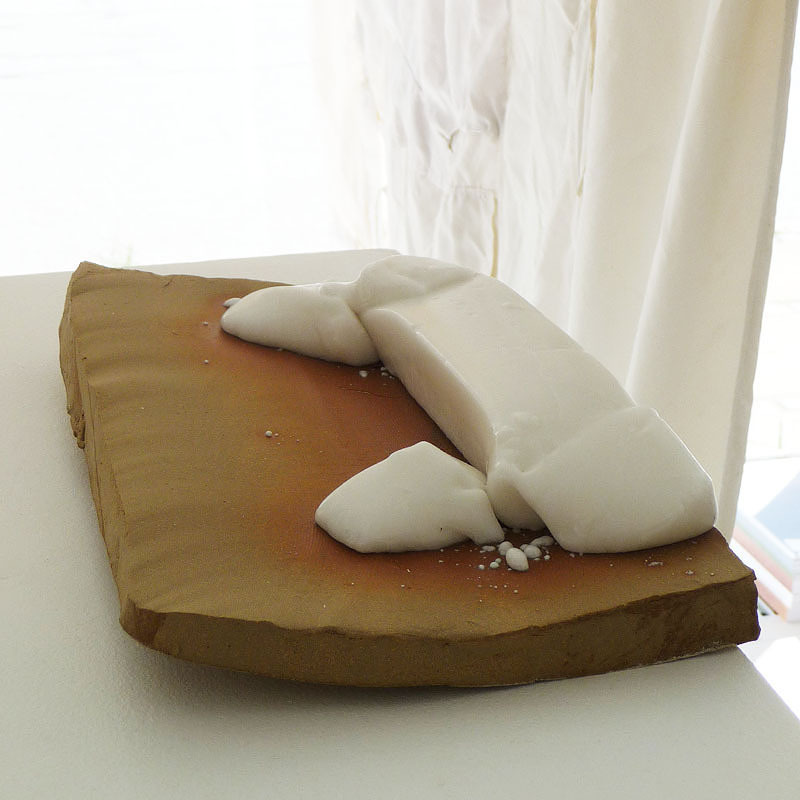 - what is, and how ceramic and clay may be understood as both material and subject in contemporary art practice. 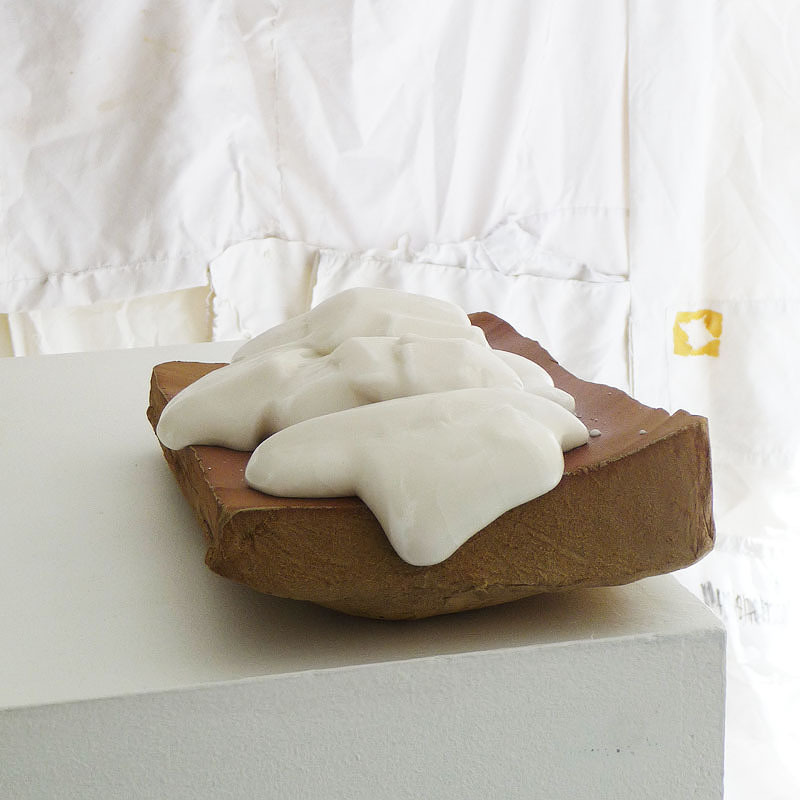 Can we understand conceive/perceive the material (clay/ceramics) to be a site, to constitute a site? Moreover, how do ceramics and clay form and construct our understanding of the site? Rapid advances in design and manufacturing technologies revolutionized production, but also led to the simplification and substitution of the people embodied skills. Cities and people are loosing their specialised skills and functions. For years, porcelain industry has struggled with fashion in a flux market. Customers demand low prices, factories replace quality with quantity. Industries move around the world to find the lowest cost and highest profit. 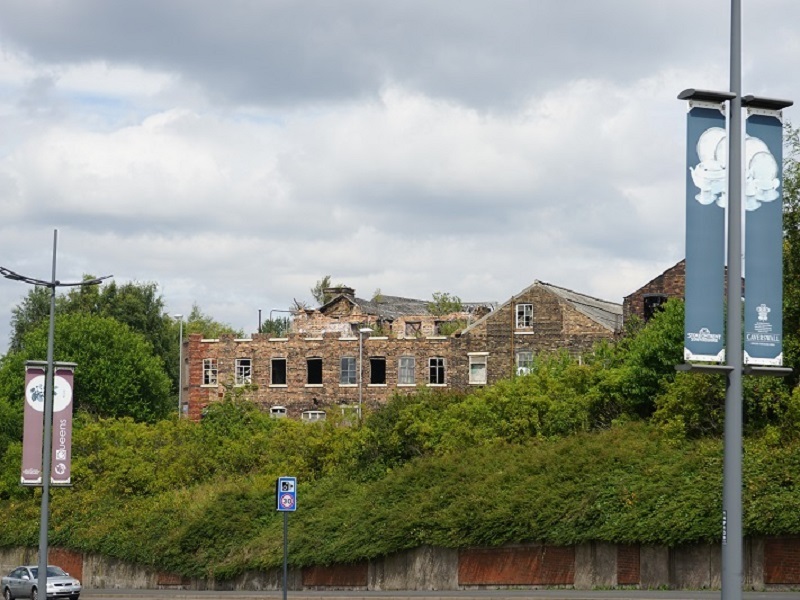 Large areas in Britain are left with empty buildings and unemployment. The vest is richest, but surrounds itself with cheap, worthless items. 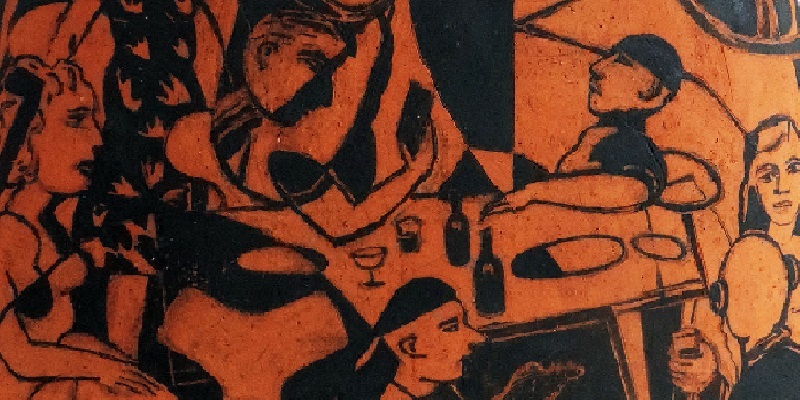 Slow-living and local production has not yet reached the majority..
NEIL BROWNSWORD examines the legacy of globalisation in relation to Stoke-on-Trent’s ceramic manufacturing sector, and the impact this has had upon people, place and traditional skills. Using film and performative installation he deconstructs and re-orchestrates complex craft knowledge within industrial production to pose questions surrounding the value and repurposing of inter-generational skill. 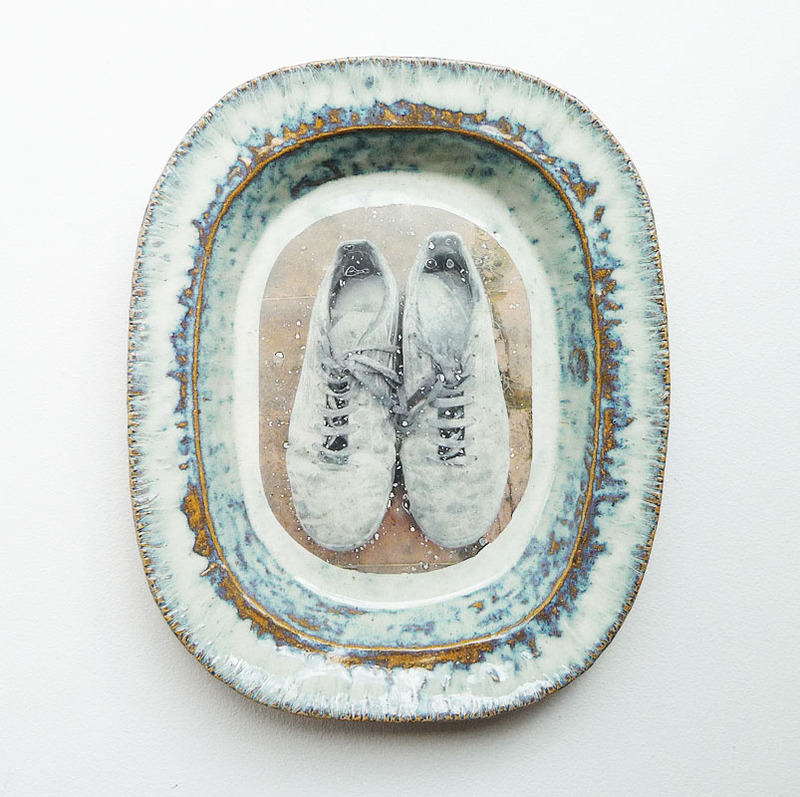 National Treasure: - with Anthony Challiner - 3 painted dishes & video. 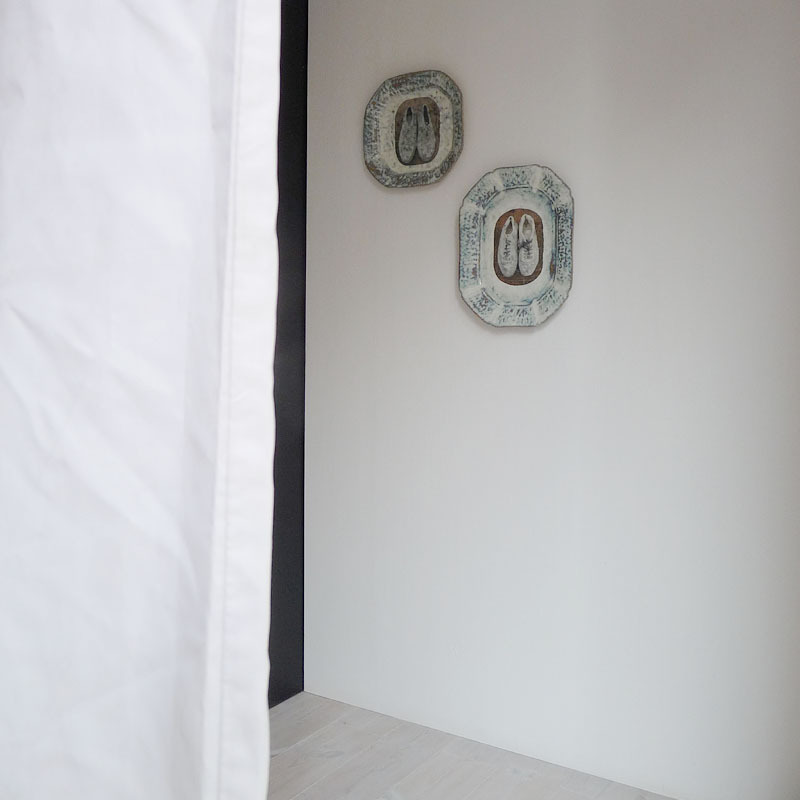 ANNE HELEN MYDLAND understands Spode's deserted display cases as monuments and echoes of the alchemical processes of transforming dust of bones and minerals into translucent bodies. 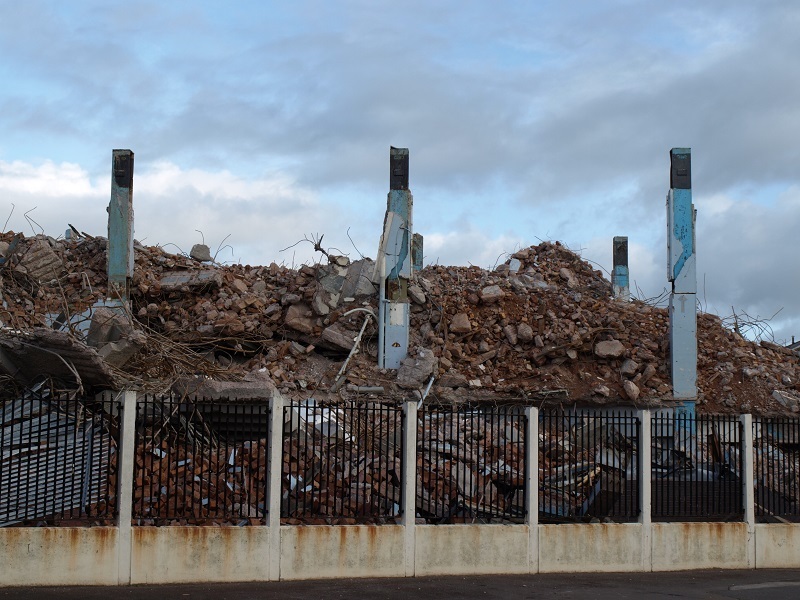 Deconstructing the foundation of what made the success of Spode and ‘the Potteries’. Pointing to the displayed presence of absence. Spode works: Monuments (2017) - Photo objects. Fired feldspar and stoneware. 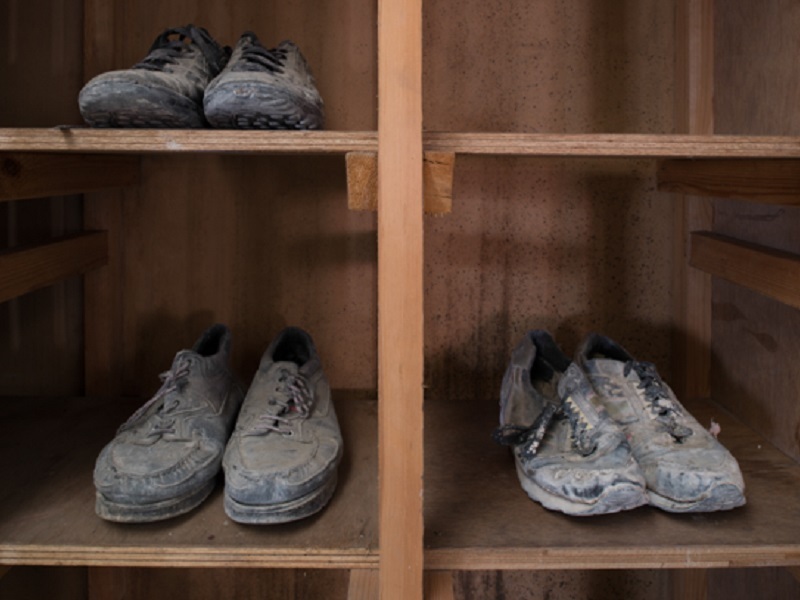 KAREN HARSBO relates conceptually to the "Topographies of the Obsolete", based on other materialities than ceramics - actual clothing and shoes from the porcelain industry and reference to the post-industrial global change of work situation - and hereby social issues. 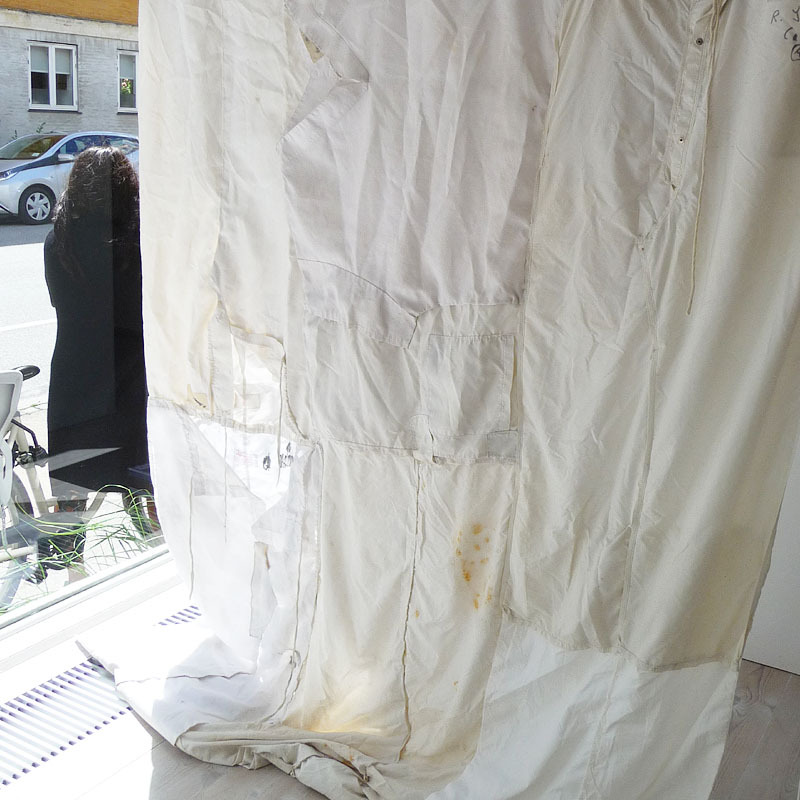 White Flag - textile. 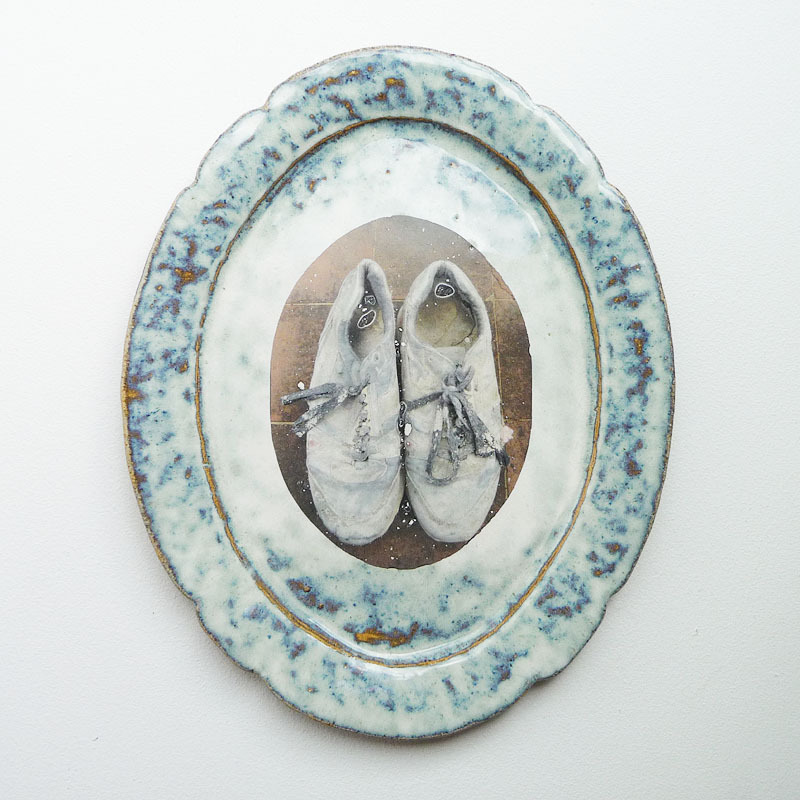 Portrait - ceramic objects, photo-transfer. 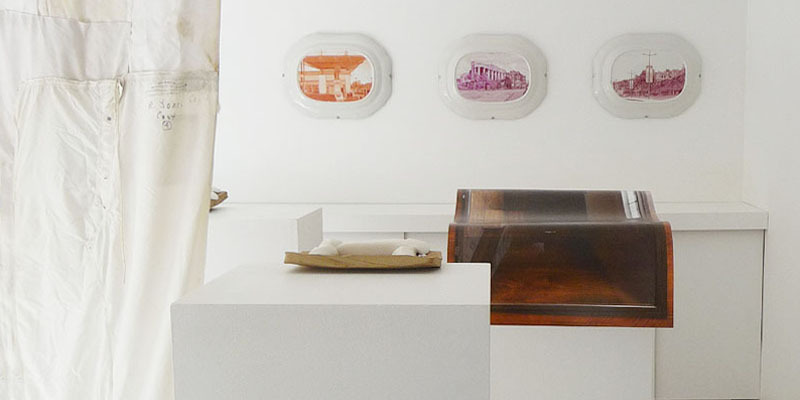 - Exploring the Site Specific and Associated Histories of Post-Industry. The artistic research project was initiated by Professors Neil Brownsword and Anne Helen Mydland at Bergen Academy of Art and Design, (KHiB) in collaboration with partner universities/institutions in Denmark, Germany, Switzerland, France and the UK. In 2012 the British Ceramics Biennial invited Bergen Academy of Art and Design (KHiB) to develop a site-specific artistic response to the former Spode Factory in Stoke-on-Trent as a key element of their 2013 exhibition programme, resulting in the exhibition: ‘Vociferous Void’. 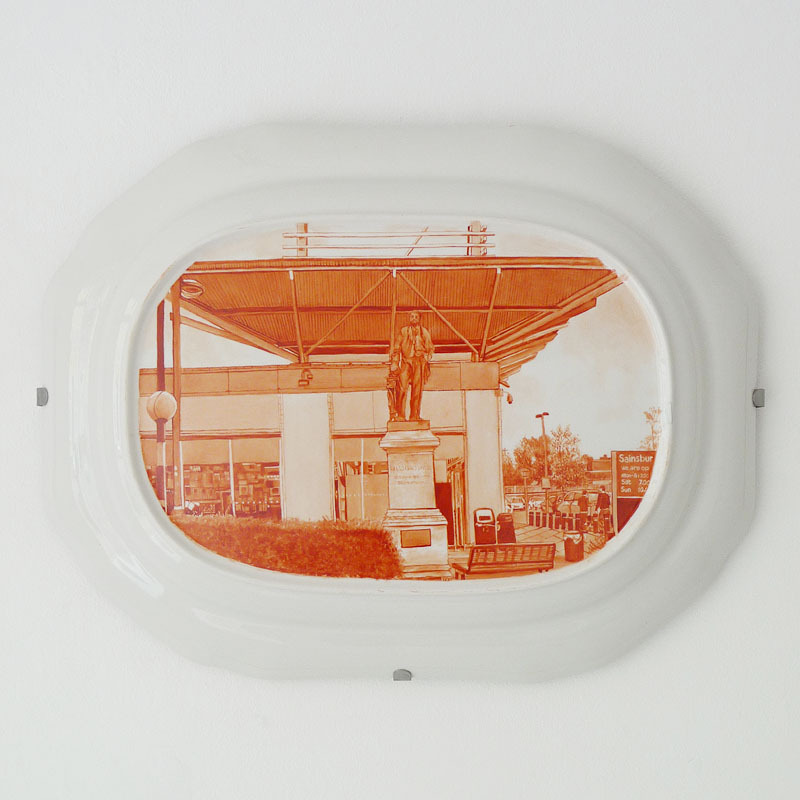 The project explores the landscape and associated histories of post-industry, with an initial emphasis on Stoke-on-Trent, a world-renowned ceramics capital that bears evidence of fluctuations in global fortunes. The original Spode Factory, situated in the heart of Stoke-on-Trent, was once a keystone of the city’s industrial heritage, which operated upon its original site for over 230 years. Amongst Spode’s contributions to ceramic history are the perfection of under-glaze blue printing and fine bone china. 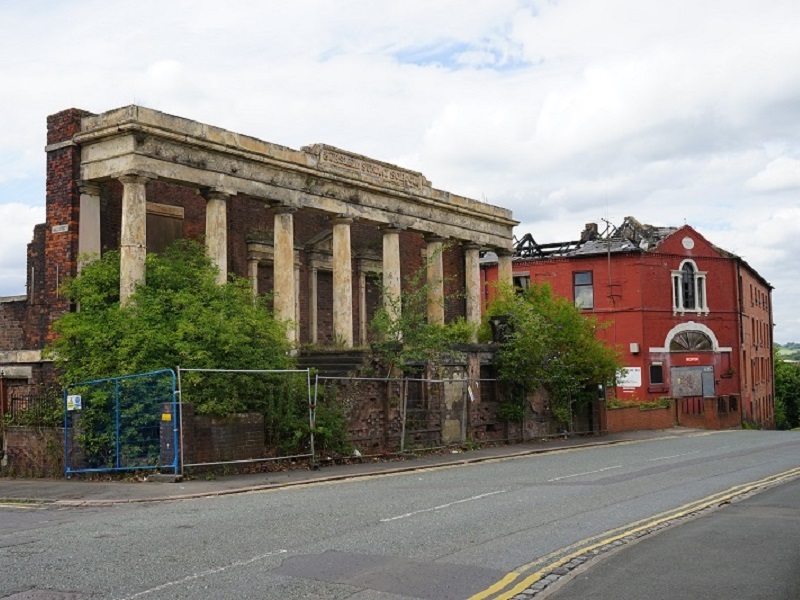 In 2008 Spode’s Church Street site closed, with most of its production infrastructure and contents left intact. The site and its remnants has been the point of departure for the interdisciplinary artistic research of over 50 participating artists, historians and theoreticians over six residencies. It has spurred a program of exhibitions, publications and seminars. 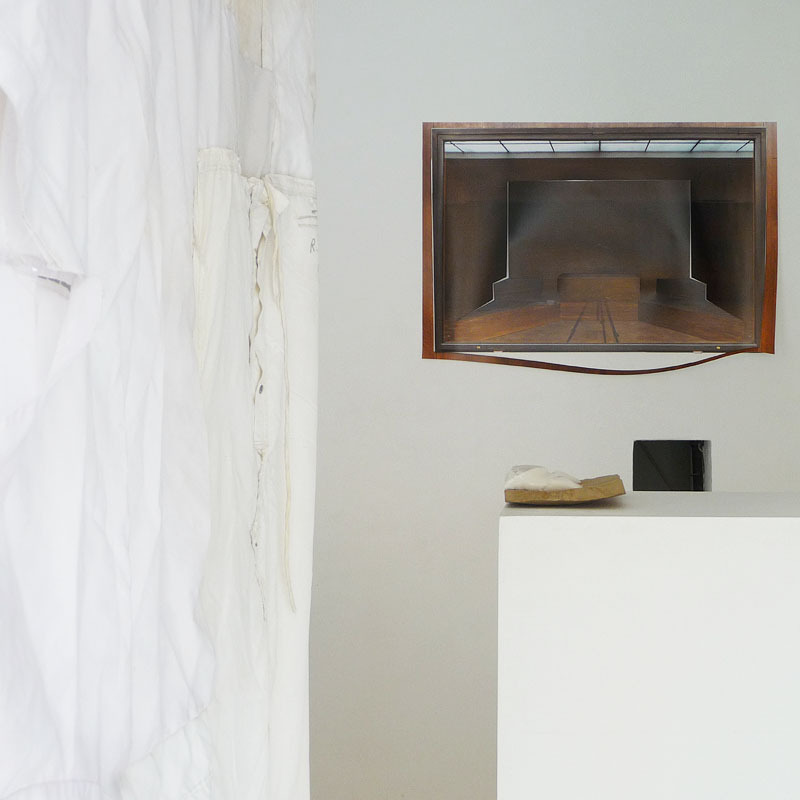 Topographies of the Obsolete is an ongoing framework, formulating topics and research strands which are treated as questions and approaches that are addressed through artistic practice. 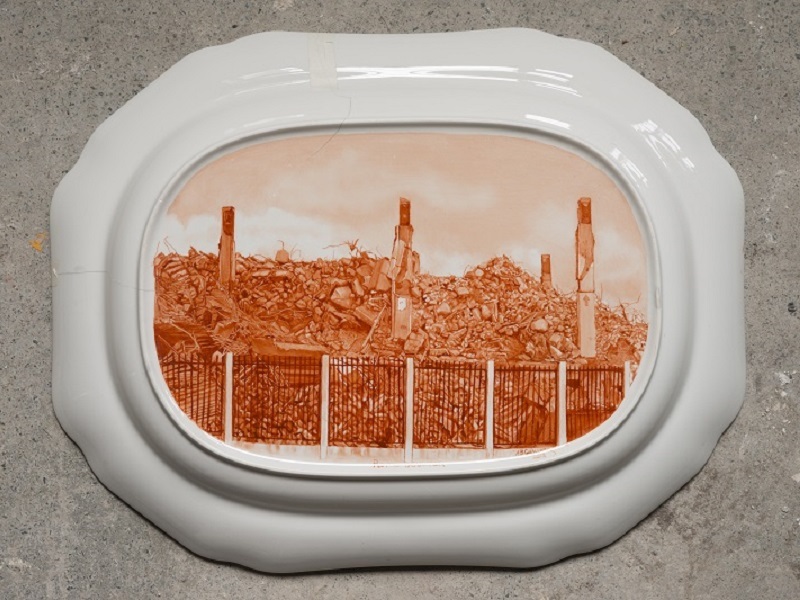 By honing in on the particular history and the singularity of this site, Topographies questions: what is, and how ceramic and clay may be understood as both material and subject in contemporary art practice. 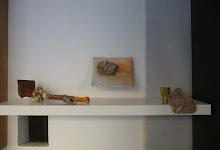 Can we understand conceive/perceive the material(clay/ceramics)to be a site, to constitute a site? Moreover, how do ceramics and clay form and construct our understanding of the site? Grateful thanks to The Danish Arts Foundation’s Committee for Crafts and Design for Project Funding in 2017. 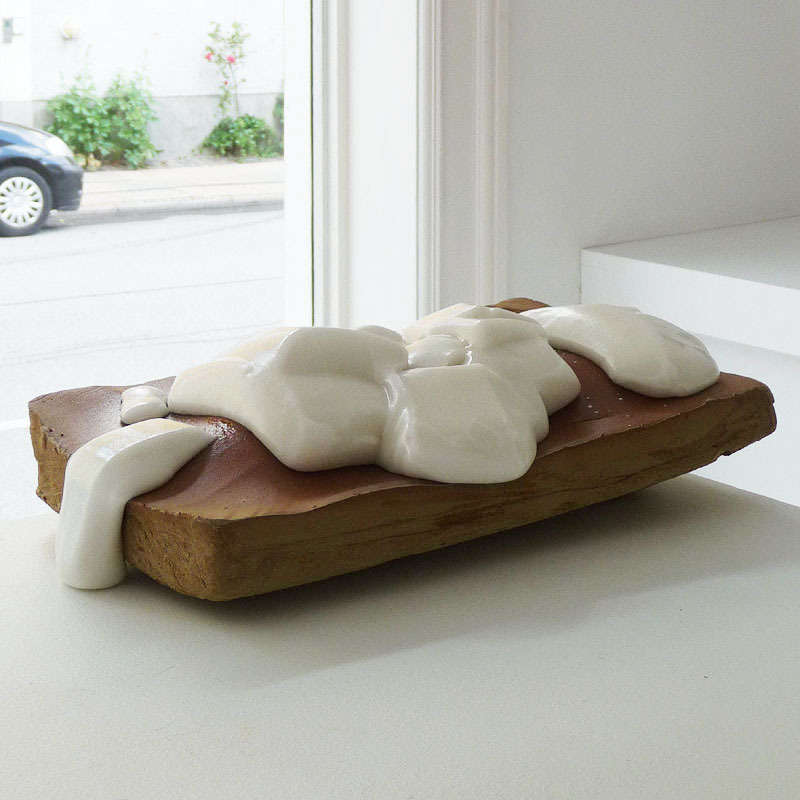 KAREN HARSBO has a philosophical and conceptual focus. 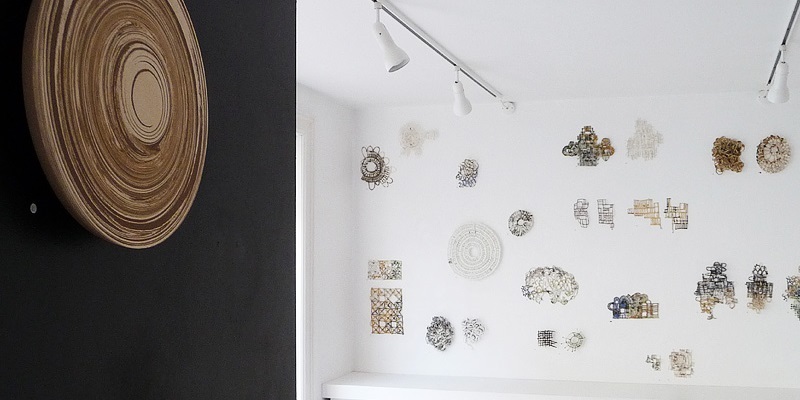 She is intrigued by ceramic history, routes, roads, mapping, floor plan, buildings, construction, reflection, fractals, signal flags, mirage, intricate map of 'mind', unorthodox mix of material and also works with 3D-printing in clay. 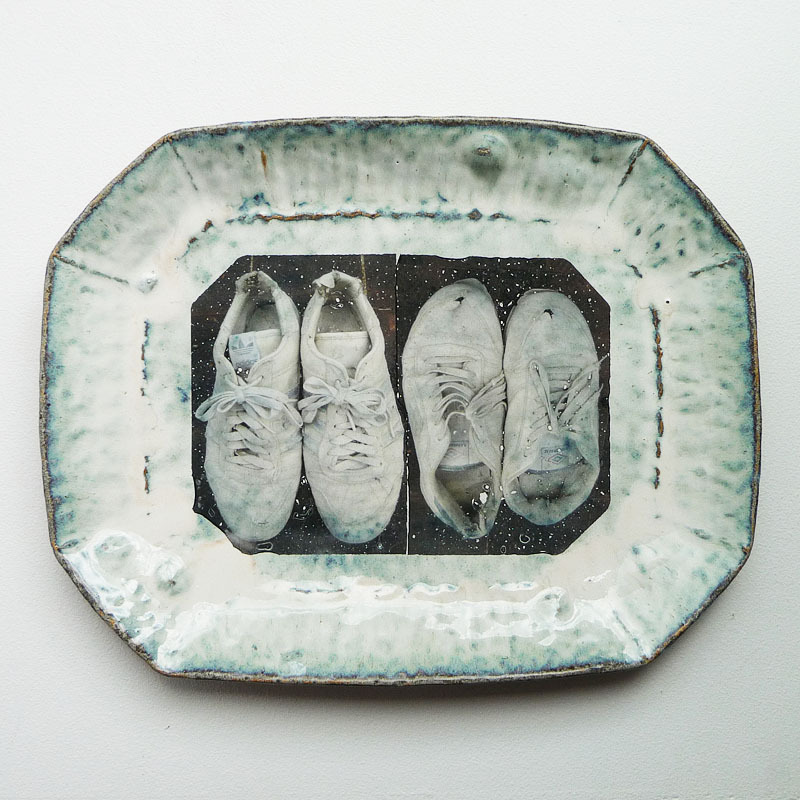 ”My pieces for this exhibition relate conceptually to the theme and as a starting point to other materialities than ceramics – such as actual work clothes and shoes from the porcelain industry. The pieces reference the post-industrial global change of work situations and hereby social issues." 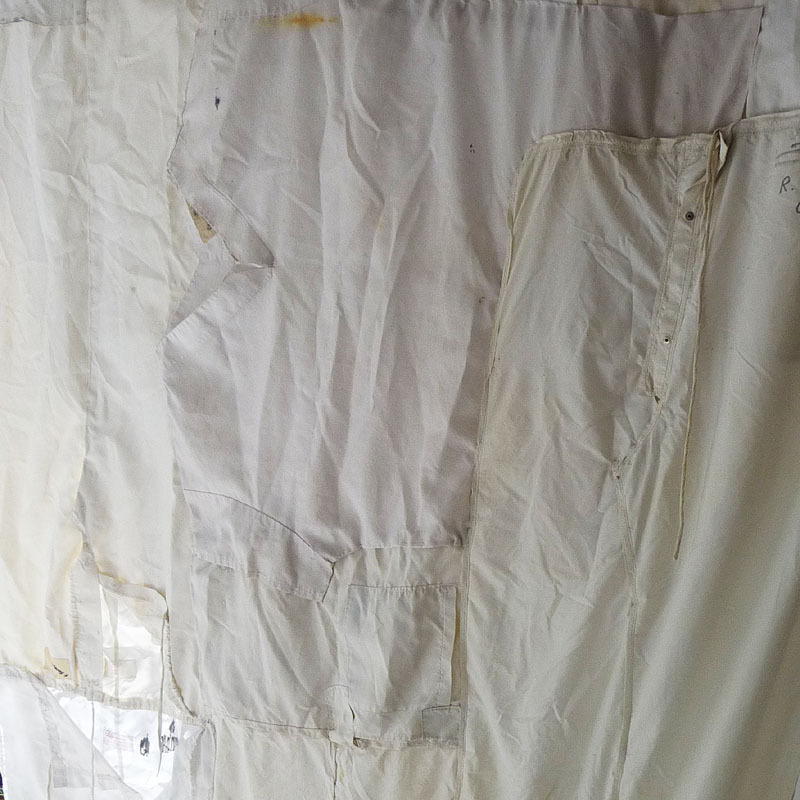 WHITE FLAG: Found workers clothes are stitched together into a rectangular flag.. a white flag.. when the sunlight shines through it becomes transparent like bone china. Uniforms are made to make people uni-form (same-shape) but I found when sowing the outline of each piece carefully together with the next, it revealed personal traces like name tags, patches and wear from use. A sense of human presence and former activities. 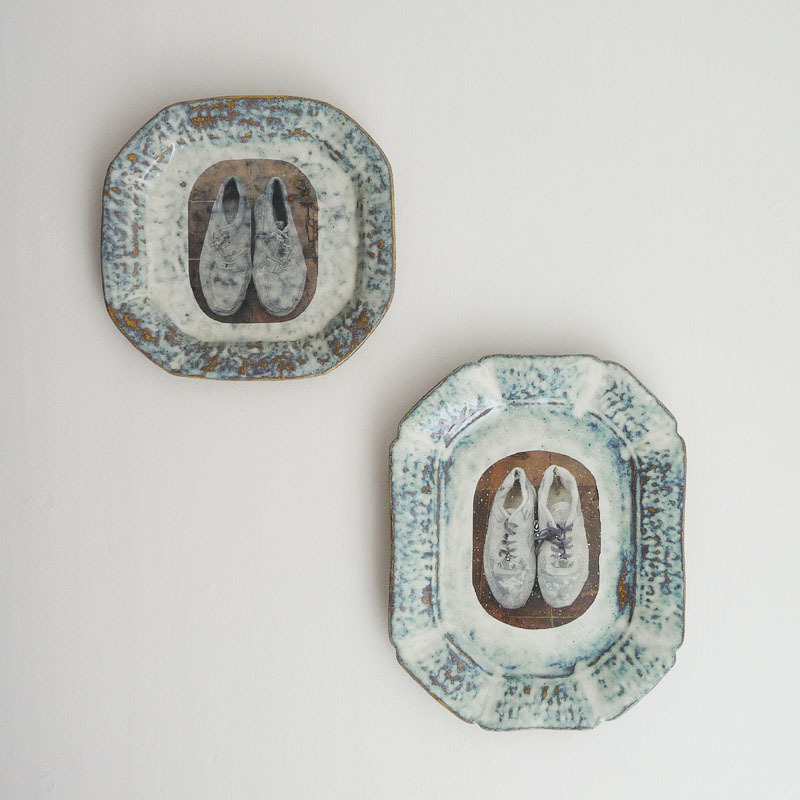 The ceramic pieces have photos of work shoes, fired into modelled copies of antique Spode-plates. 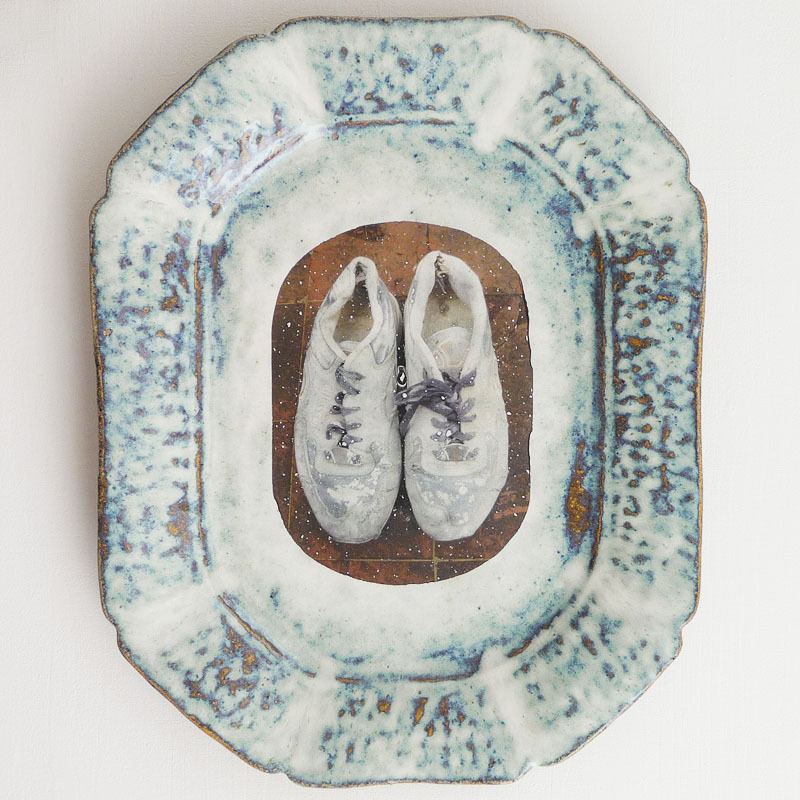 Textile and ceramic objects/ picture-plates. 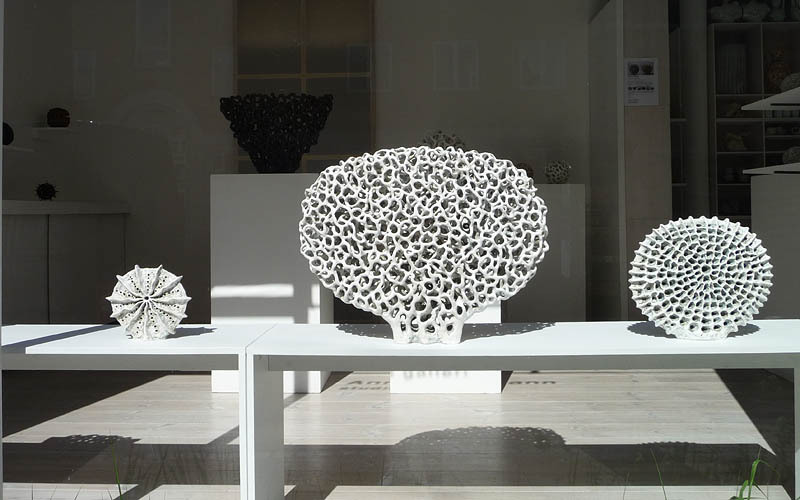 KAREN HARSBO works as associate professor at the Royal Danish Academy of Art's ceramics Laboratory. 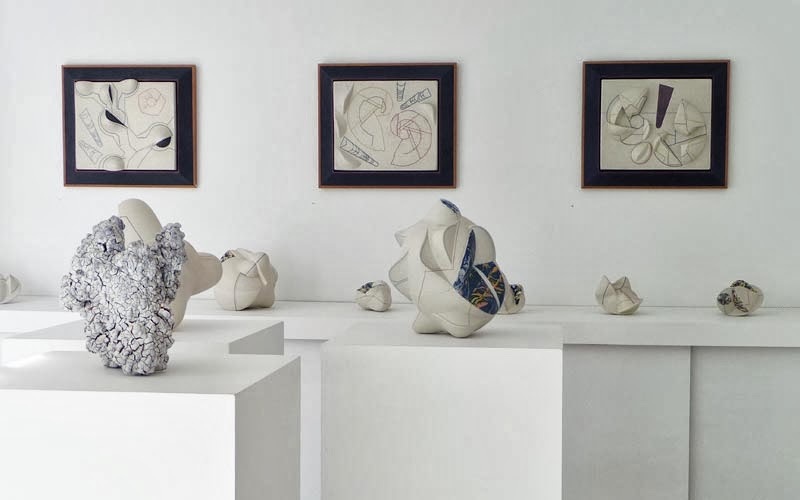 Karen graduated from the Danish School of Arts and Crafts (now the Art Academy's design school); but for several years she has had her main interest in the contemporary art world, specializing in ceramic materials, artistic and practical advice to the graduate students. She has her own artistic practice, exhibitions and commission projects, as well as working as a curator in a very active and productive professional life. 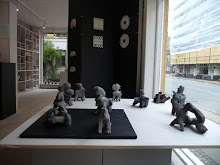 In 2011, she curated (with A.Tovborg) an international exhibition: THE MAGIC OF CLAY – Ceramics in Contemporary Art, Holtegaard Museum, Denmark. 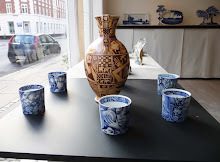 ”Spode works had its own collection room; The Art Gallery was a grand room built in the early 1940s specifically for the owners of Spode, the Copeland family, to display their private collection of ceramic ware from Europe, Asia and the Spode factory itself. 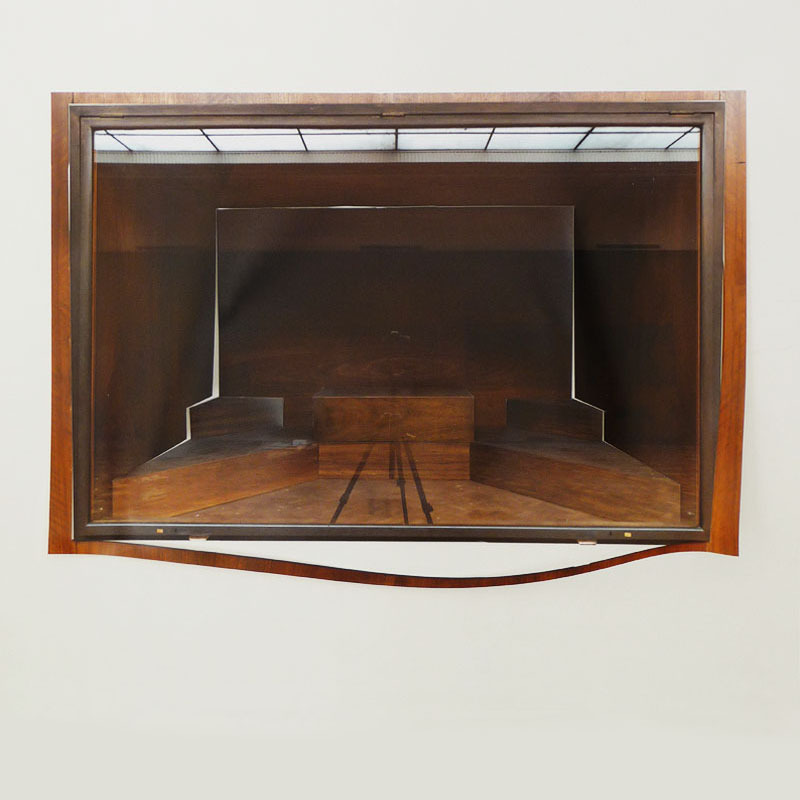 The interior is lavishly designed with exotic wood panelling and built-in brass framed cabinets, constructed so as to give the illusion of being paintings. This room was for management, board meetings, private and VIP occasions. Parallels with the chambers of curiosity (Wunderkammer) of the 1600s are easily drawn. Now deserted, its collection removed, and in a state of decadent decay, the gallery appeared to be a prime example of the fetishization of the past, a place where only memory resides, and a symbol of the region which still proudly calls itself “The Potteries” though most of the ceramic production is long gone and has moved elsewhere. But the room was not the memory, but more the casing of it. I have tried to understand these deserted displays- as monuments and echoes of the alchemical processes of transforming dust of bones and minerals into translucent bodies. 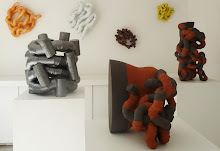 ANNE HELEN MYDLAND is Professor of Clay and Ceramics, Department of Fine Art, Bergen Academy of Art and Design, Norway. 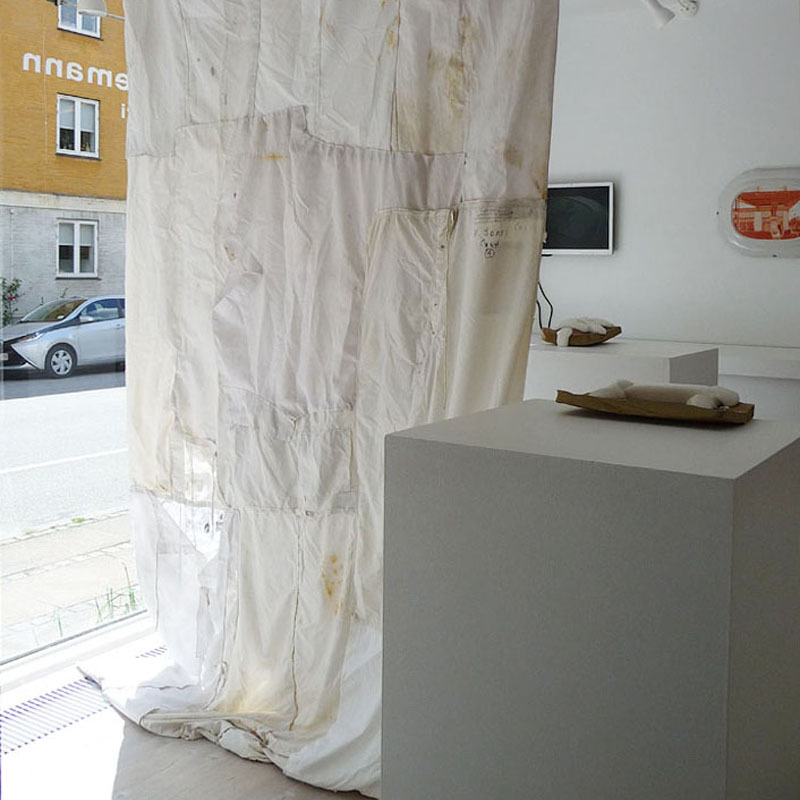 Her artistic practise and research explores how private and public narratives and memory functions and are manifested through objects. 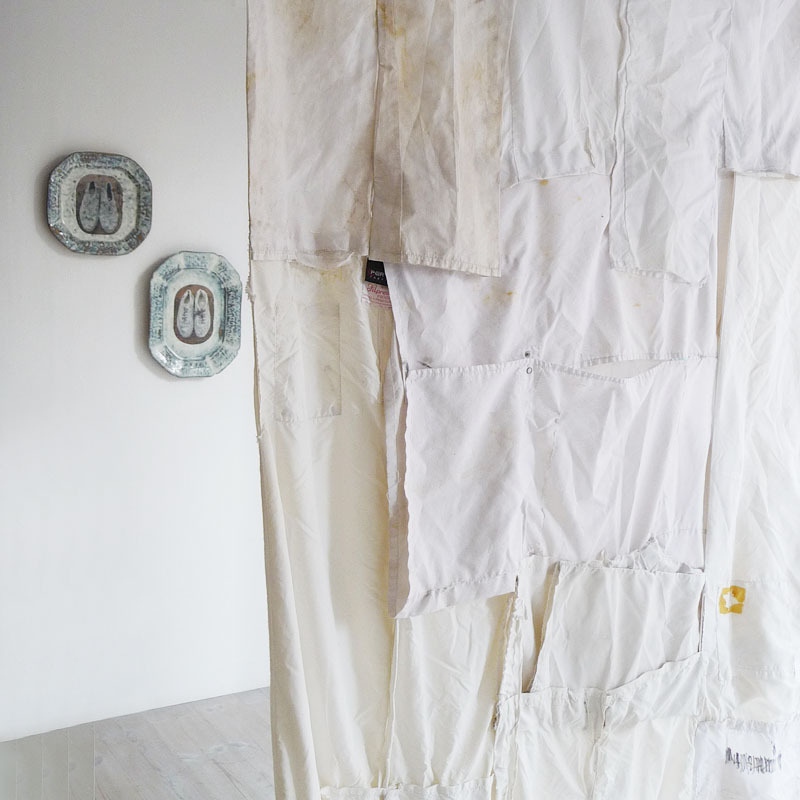 In montages and installations using found objects and sites, she is explores different ways we perceive, and relate to objects, both as evidence, cultural signifiers and personal relics and souvenirs. 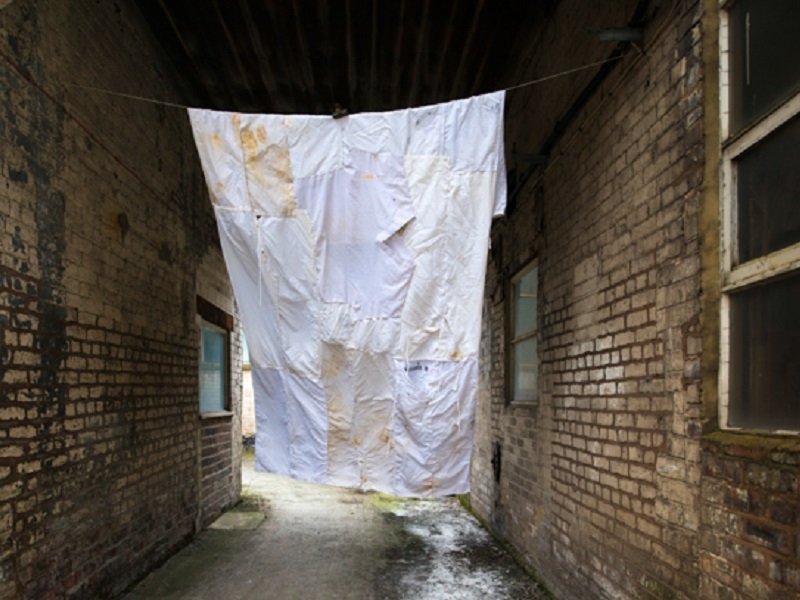 She is initiator and co-project leader of the on-going artistic research project ‘Topographies of the Obsolete- exploring the site specific and the landscape of post-industry’. Anne Helen Mydland holds an MA Degree from Bergen Academy of Art and Design (2000), and has since worked as both artist and curator. 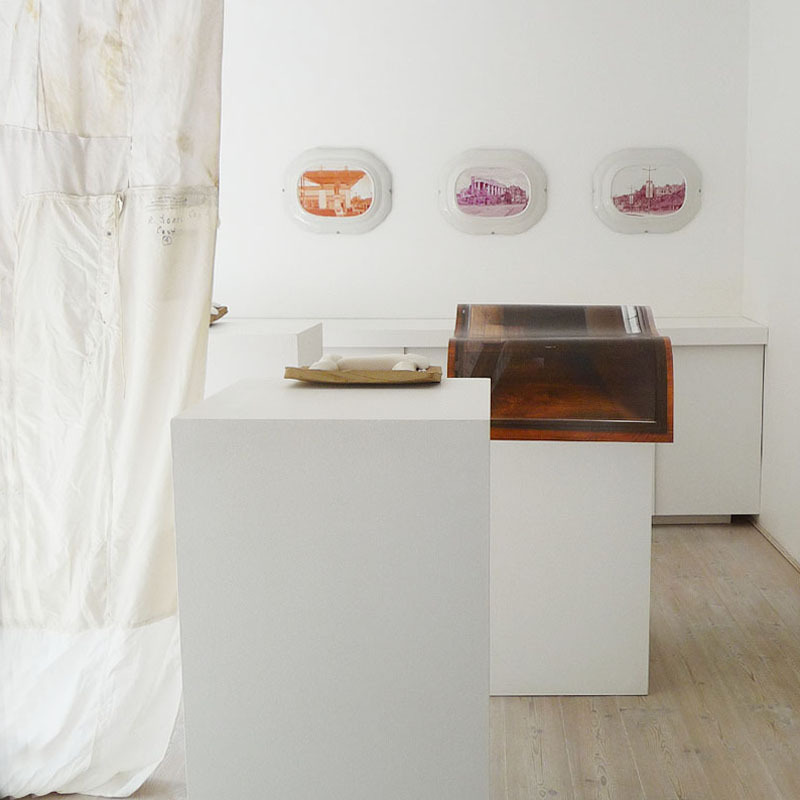 Mydland has exhibited widely in Norway and internationally, and her works have been purchased for leading collections and institutions, not least for the Museum of Contemporary Art (NO). "For centuries the transmission of manual dexterity in North Staffordshire’s ceramic industry has remained an intergenerational practice. 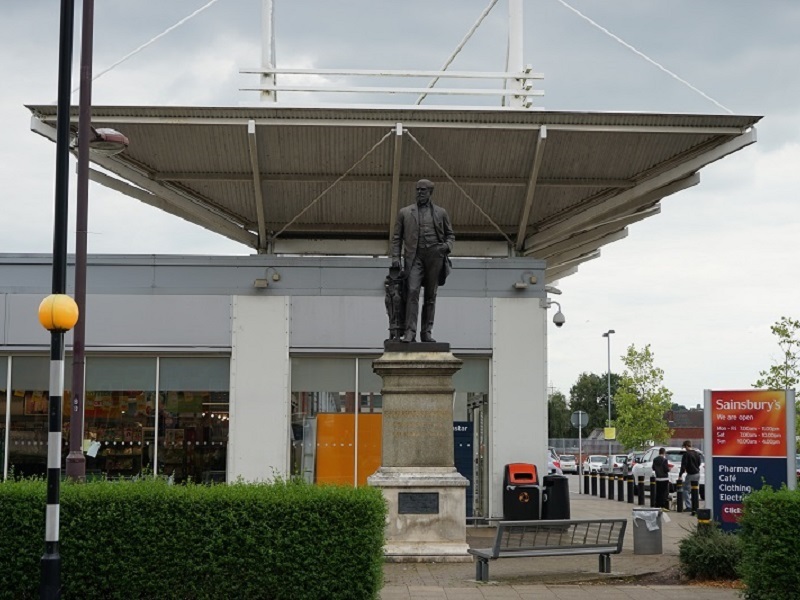 However the continuity of skill supply to this sector has been severely disrupted over the last three decades, as 10’s of thousands of employees have been displaced following its subsequent contraction. Rapid advances in design and manufacturing technologies have without doubt revolutionized production, but they have also led to the simplification and substitution of the people embodied skills once needed to sustain product leadership. Companies that survived the impact of foreign competition have in recent years embraced factory tourism as a means to capitalise on profit. 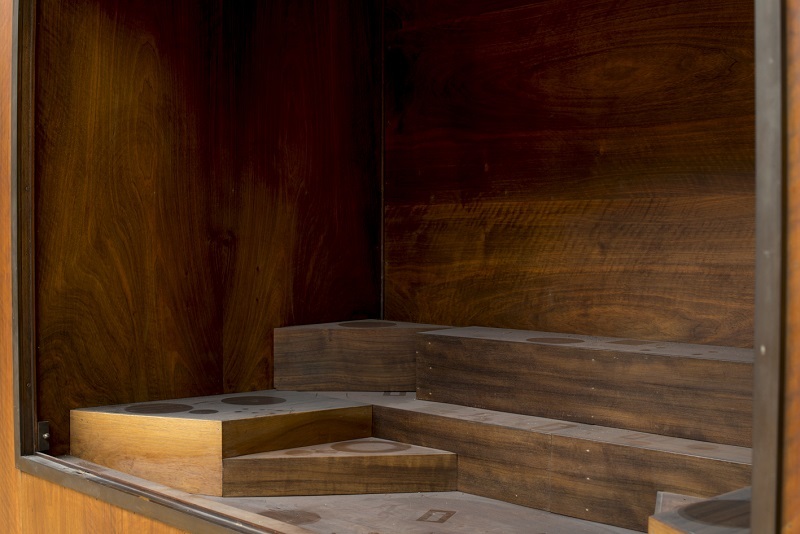 Communities of labour that once coexisted in spaces devised to accommodate the flows of manual production have radically downsized, succumbing to the veneer of the visitor centre experience. In these situations the reality of mass automation and cheap outsourcing is obscured by clever marketing strategies that heighten the hand made/hand decorated to strengthen sales. Many high-end skills that were once the flagship of renowned manufactories are nowadays deemed as outmoded or economically unviable to accommodate rapid shifts in consumer buying trends. As older tiers of highly specialised labour gradually diminish, there remain few apprenticeships to secure the effective transfer of this knowledge for the future. 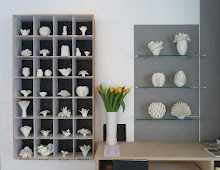 In an attempt to elevate the status of these threatened or redundant practices the primary objective of National Treasure has been to re-stage the performance of high-end ceramic skill at a variety of loaded locations. The work has involved the hire of a small group of china painters – Peter and Marie Graves and Anthony Challinor, once employed by renowned manufactures that include Spode, Royal Douton and Coalport. These remain amongst the last generation of china painters in Stoke-on-Trent whose profession has gradually been displaced by the changing tides of fashion and by ceramic print technologies for mass production. Although National Treasure parodies museological and factory tourist models of the ‘artisan on display’, there are numerous factors that distinguish this work from these traditional formats. To amplify tension points that subvert passive spectatorial consumption, the china painters were set to work in a post-industrial context amongst the wreckage and disorder of the former Spode factory. Separated behind glass as they plied their skills the viewer is confronted with an ethical burden that evokes both admiration and discomfort. Objectified as ‘exhibits’ themselves against a backdrop of abandonment and destruction, serves a poignant reminder to the industry’s recent economic downturn and human fallout. 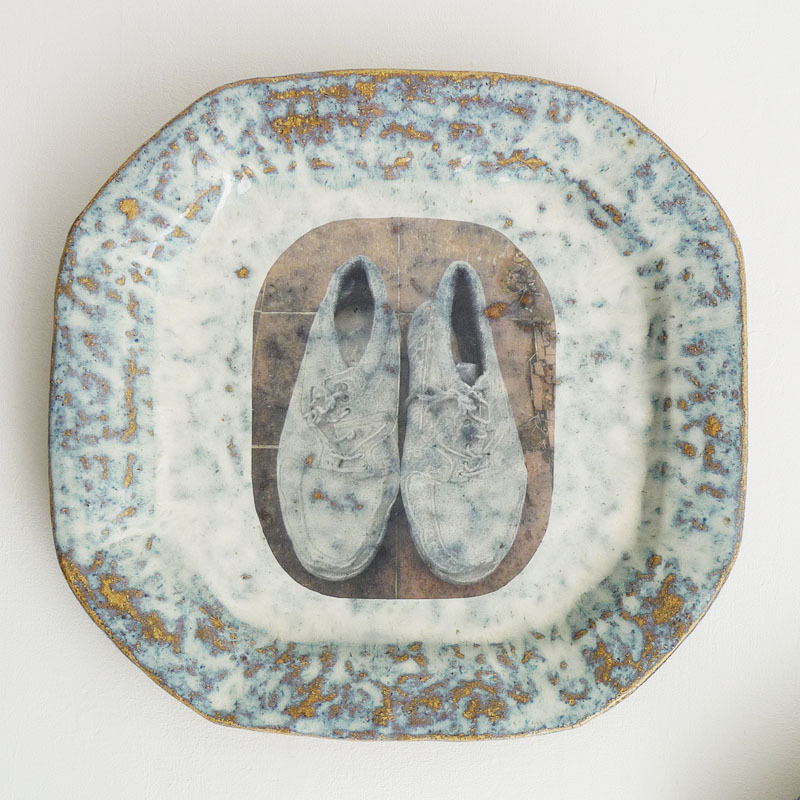 Whilst in residence the artisans were instructed to paint on the backs of damaged and discarded plates found on-site at the Spode factory, with imagery that aped 18th century ceramics’ romanticization of British ruins. Though depicting picturesque decay was not the objective. Spaces where painters would traditionally assign their personal insignia to indicate their identity and pride in their workmanship, were instead graced with images documenting the ruination and post-industrial wastelands of Stoke-on-Trent. Apart from my request of a monochromatic or full colour painted facsimile of the supplied photographic imagery, it remained key that the painters were free from interference to retain their aesthetic identity. Working within their own structures for as much or as little time as they liked, each artisan would occupy the space intermittently, dissolving the hierarchical relationships between employer and employee. 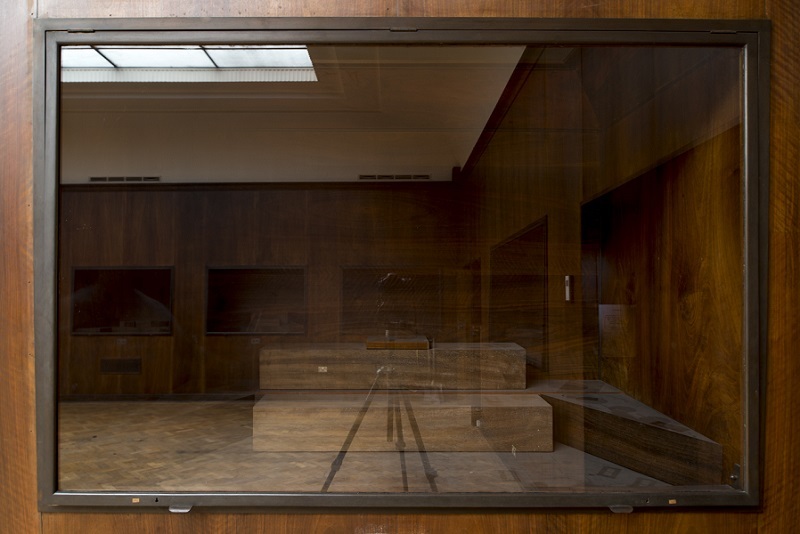 In their absence, the vacant but illuminated workspaces together with the residues of half completed vignettes and palettes of colour only added to the works metaphoric ‘presence’. Paradoxically the delegation of this work itself became a form of outsourcing. However with the appropriation of people and their skill as a ‘raw material’ the ethical implications of this process remained paramount. Artisans were employed at their indicated rate of pay and informed explicitly of the ideas and their role in the work. Full recognition of their identity was credited in the installation during their activation of it. Also as they were the very people immediately affected by the issues the work raises, their willingness to participate in it only strengthened its realisation. The status given to individuals with exceptional artistic ability has long been a concern of many Oriental countries as a means to preserve and cultivate cultural heritage, but this value system remains alien to Britain. National Treasure attempts to raise greater awareness of an intangible cultural heritage that is in dire need for greater recognition and protection, not from the point of nostalgia but as a means of preserving a sense of identity and continuity to be shared and passed on. Collectively this performative installation is a strategy to invite eulogy and to heighten public awareness of what are frequently overlooked forms of human intelligence from a rapidly disappearing culture of labour. The work attempts to highlight what’s going and what’s gone, with the hope to sustain and re-purpose what remains of these cultural assets for future generations." 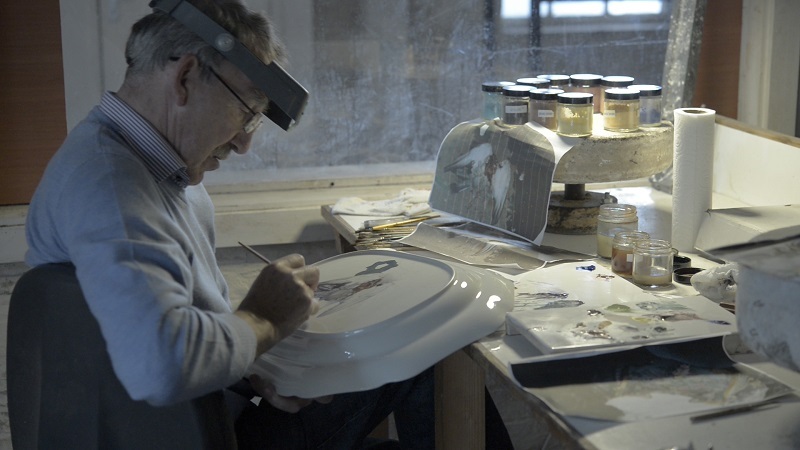 National Treasure: Neil Brownsword with Anthony Challiner - 3 painted dishes. 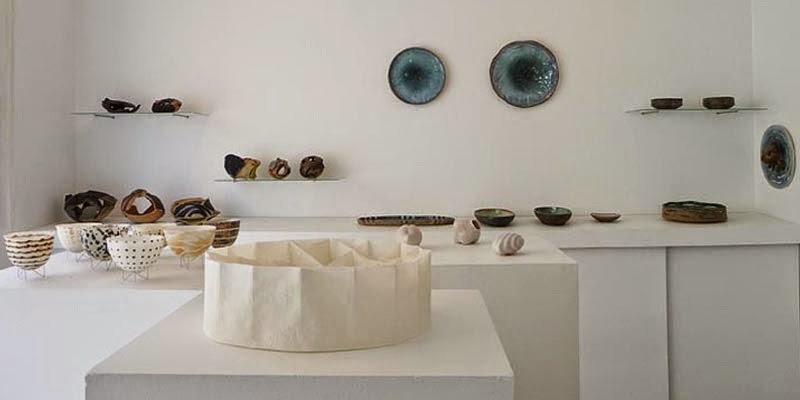 NEIL BROWNSWORD is an artist, researcher and educator who holds Professorial positions in ceramics at Bucks New University and University of Bergen, Norway. 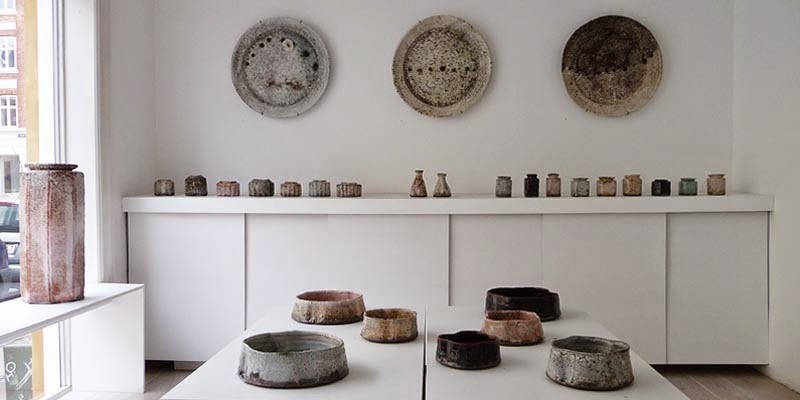 His practice examines the legacy of globalisation in relation to Stoke-on-Trent’s ceramic manufacturing sector, and the impact this has had upon people, place and traditional skills. Using film and performative installation he deconstructs and re-orchestrates complex craft knowledge within industrial production to pose questions surrounding the value and repurposing of inter-generational skill. 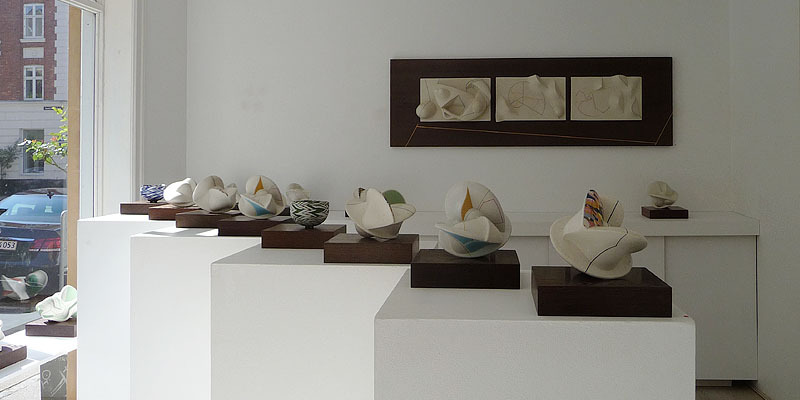 His work is represented in public/private collections internationally, including the Victoria and Albert Museum, Middlesbrough Institute of Modern Art, Korea Ceramic Foundation, Yingee Ceramic Museum Taiwan, Fu Le International Ceramic Art Museum China. 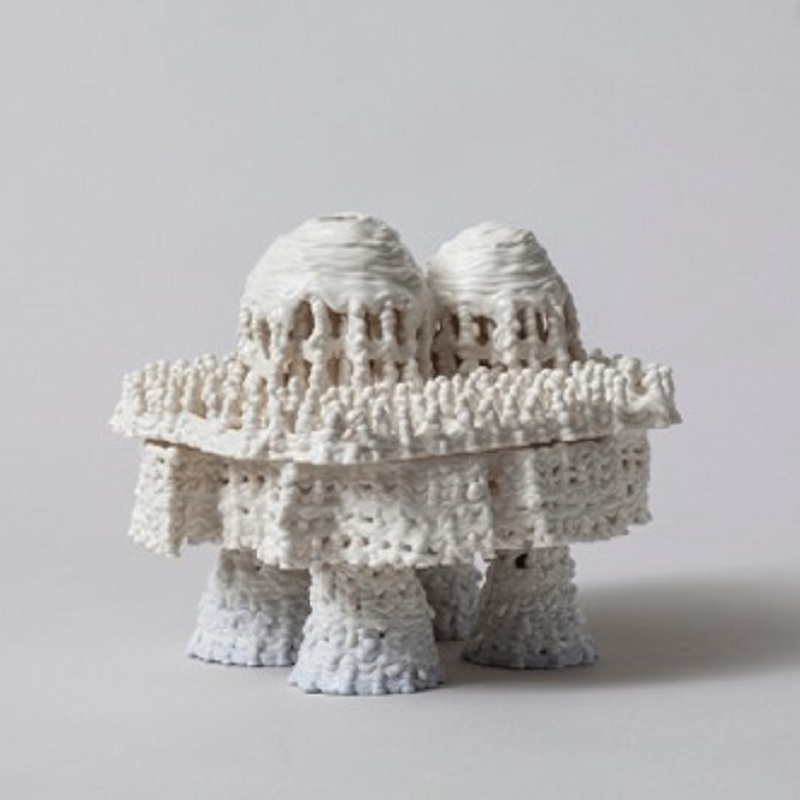 In 2009 he was awarded the ‘One Off Award’ at the inaugural British Ceramic Biennial, and the Grand Prize at the Gyeonggi International Ceramic Biennial, South Korea in 2015. 2016 Skovhuset, Værløse, ”Pathways”, & Huset i Asnæs. 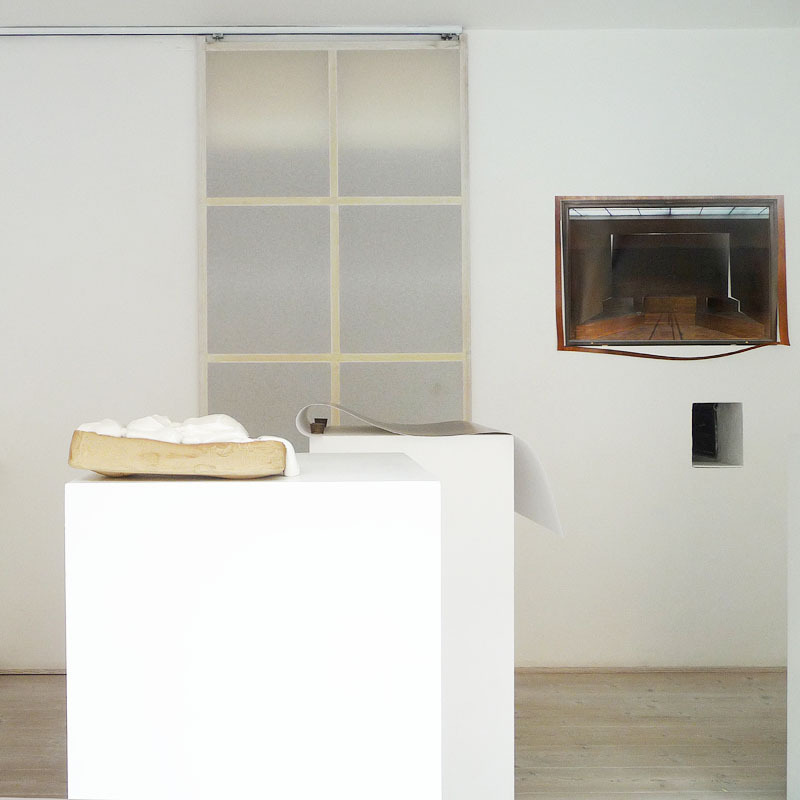 2015 Silkeborg Bad Kunstcenter, ”Sanatorium”. 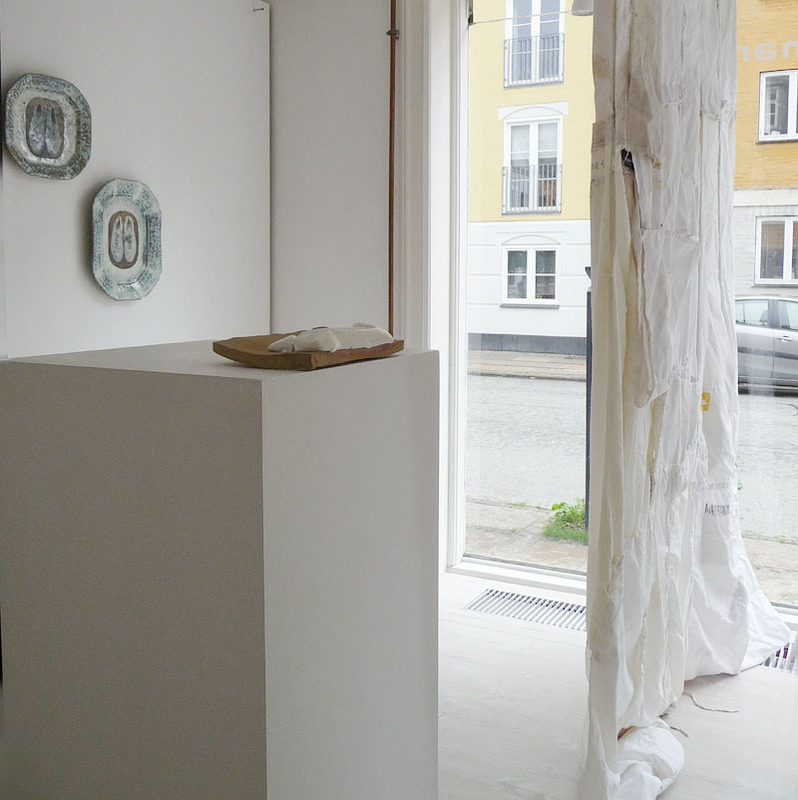 2014 Bornholms Art Museum, ”European Ceramic Context”. 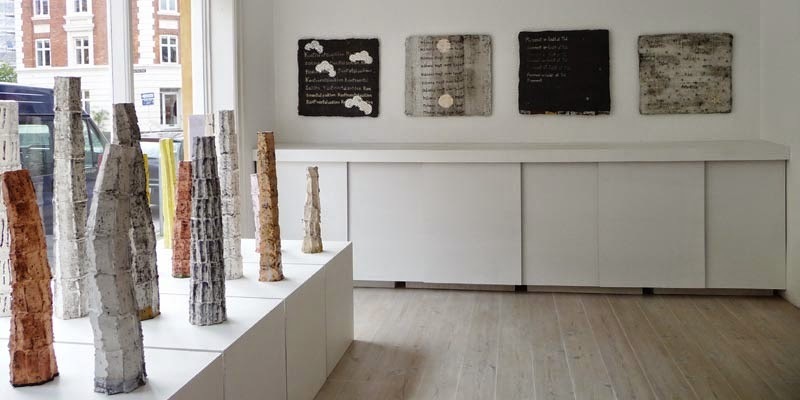 2014 Ceramic House Gallery, UK”, Contemporary Danish Ceramics”. 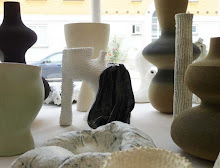 2013 British Ceramic Biennial, Stoke-on-Trent, UK. Japan Journey, The Japanese Embassy, DK. 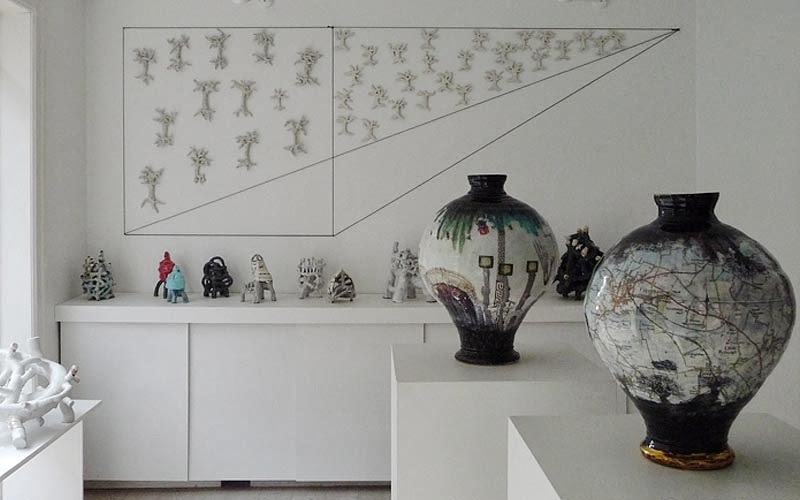 CLAY Museum of Ceramics - Network, Funen. Artist, researcher and educator, Professor in ceramics. BORN 25th November 1970, Stoke-on-Trent, Staffordshire. 1989–90 BTEC National Diploma, G. A. D. (Distinction). Newcastle-U-Lyme College, Staffordshire. 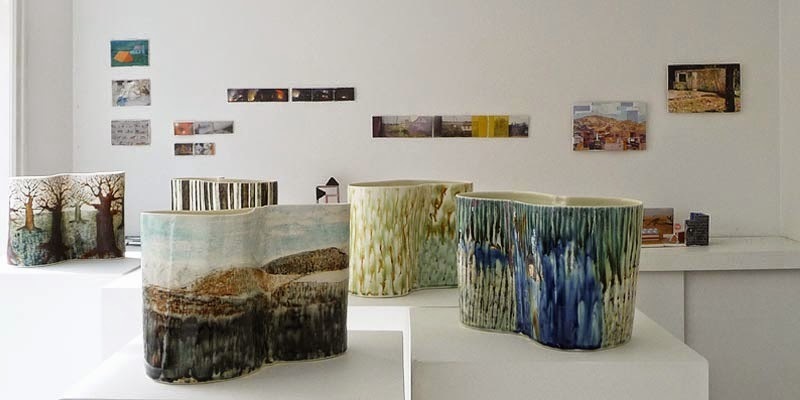 1990–93 BA (Hons) Ceramics. First Class, with Historical & Theoretical Studies commendation. University of Wales, Cardiff. 1993–95 M.A. 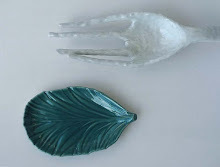 Ceramics and Glass. Royal College of Art, London. Examiners Award. 1999–06 PhD, Brunel University, London. 2015-.. Bucks New University, High Wycombe, Professor of Ceramics and Glass. 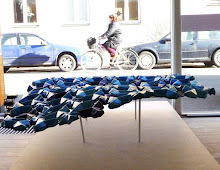 2011-.. Bergen Academy of Arts and Design, Norway, Professor II, Department of Fine Arts. 2017 Neil Brownsword: Factory, Korean Ceramic Foundation. Blas & Knada, Stockholm (solo). 2016 Central China Ceramics Biennale, Henan Museum, China. 2015 Re-Apprenticed: Observation, Raphael Gallery, Victoria and Albert Museum. 2014 Neil Brownsword, The Broadcaster, Lincoln. 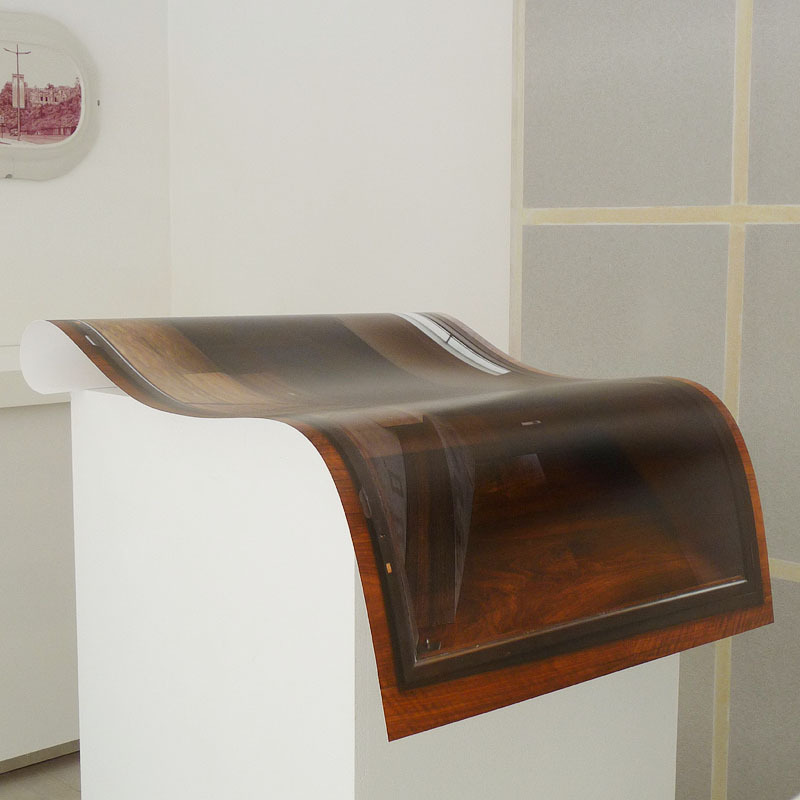 2013 Topographies of the Obsolete: Vociferous Void, British Ceramics Biennial, Stoke-on-Trent. 2011 British Ceramics Biennial 2, Selected artist for response to the Spode site. 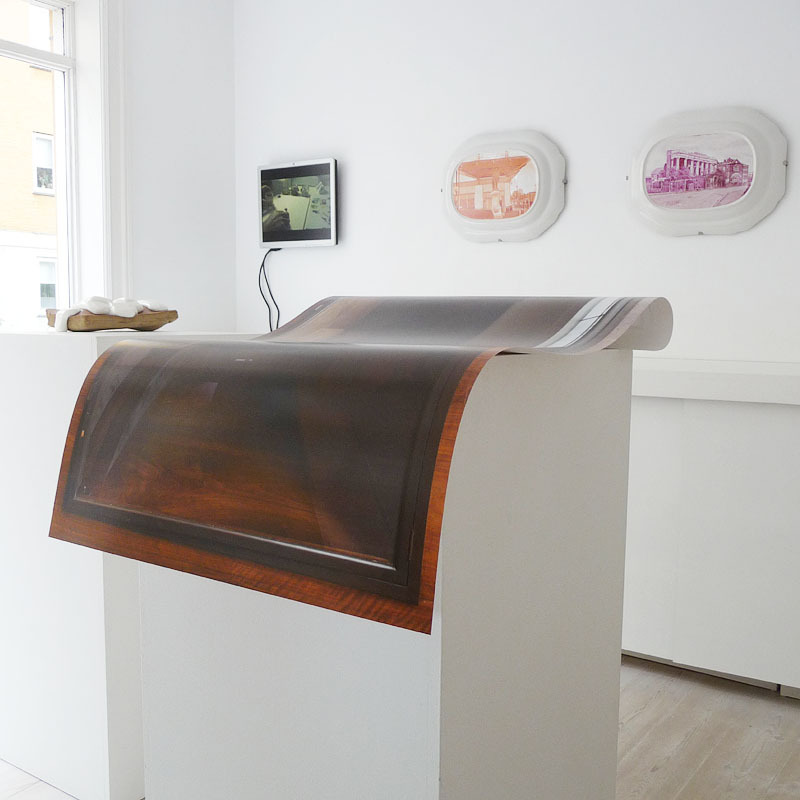 2010 Happenstance: Neil Brownsword & Karen Harsbo, Ann Linnemann Gallery, Copenhagen. 2009 Elegy. Neil Brownsword, Blas & Knada, Stockholm (solo). 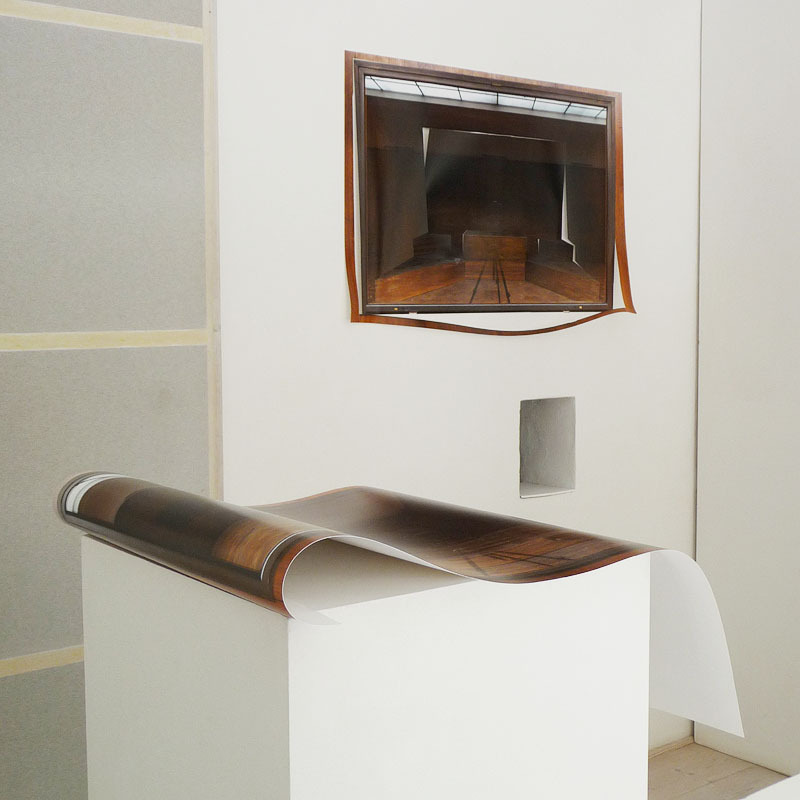 2008 Neil Brownsword: Poet of Residue, Galerie Besson, London (solo). 2005 Collaging History, Museum, Stoke-on-Trent. Blas & Knada, Stockholm (solo). 2002 Sofa, International Trade Fair, New York Represented by Nancy Margolis, New York. 2000 British Ceramics. 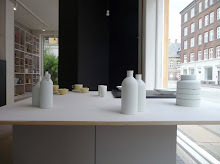 Clay - Museum of Ceramics, Denmark. 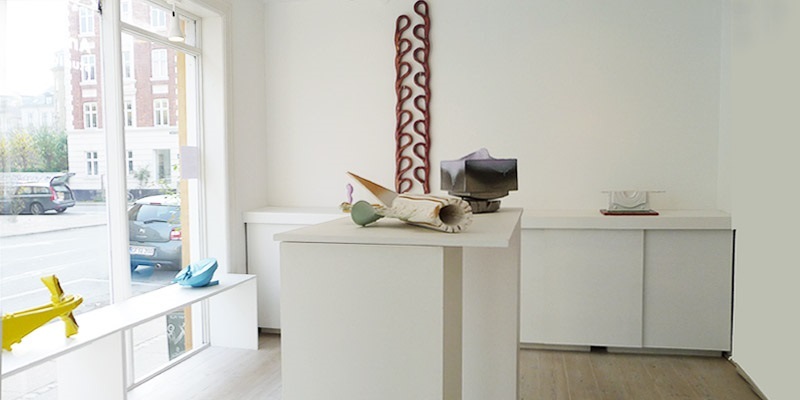 2000 Neil Brownsword, Gallery for New Ceramics, Copenhagen (solo). 1995-2000 Bergen Academy of Art & Design, Specialised Art, ceramics. 1997 (Fall) Universidad de Sevilla, Bella Artes, Spain. 1993 (Fall) Universidad do Porto, Arkeologi, Portugal. 2010-11 Førsteamanuensis 100% Bergen Academy of Art & Design, director of Ceramics. 2015 (Spring) Constituent Dean, Art Department, KHIB. 2011- 2015 Artistic director, Art Department, KHIB. 2007-10 Første Amanuensis 50% Bergen Academy of Art & Design. 2007-08 Konstfack, Teacher at ceramics and glass, Stockholm. 2003-07 Associate Professor 50%, Specialised Art, ceramics. 2015 'Either way… TEMP- Bjørgan, Moen Mydland Thomassen’ KABUSO, Øystese. 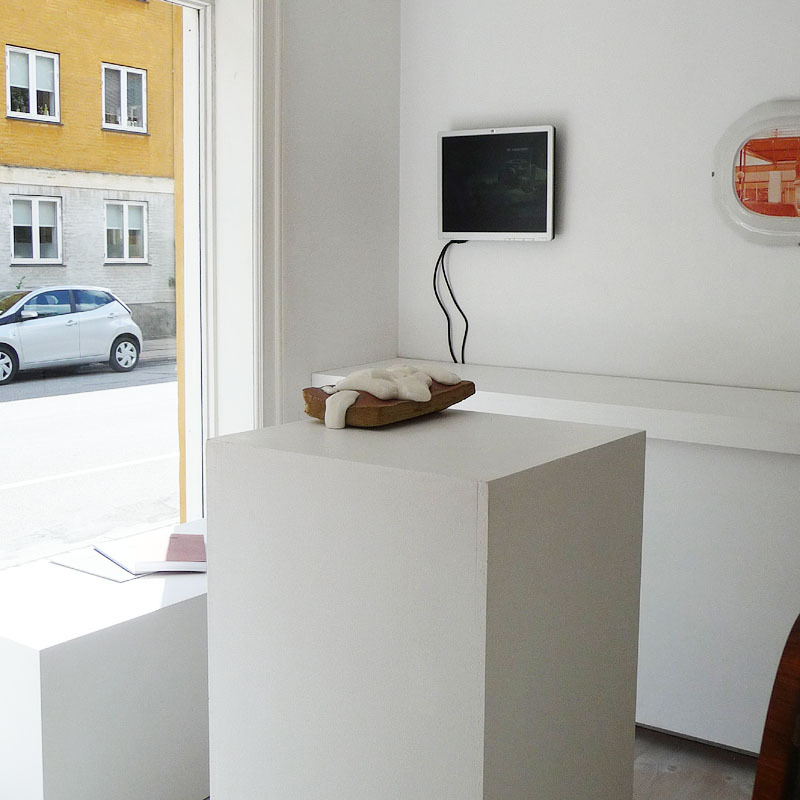 2010 'Made in China: 2# still life’, Art1, Bærum. 2004 'Relikvier', Trøndelag Centre for Contemporary Art & Rogaland Art Center. ‘Bare TEMP’, Visningsrommet USF, Bergen. 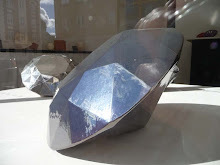 2003 ’Relikvier’, Art Association (Kunstnerforbundet), Oslo. 2000 Statens reise og studiestipend. Norsk kulturråd.